Ruth Ilg, an award-winning artist, photographer, and trilingual poet, is a native of Germany. She resides and works at Biltmore Lake, North Carolina, and at Lake Constance, Germany. 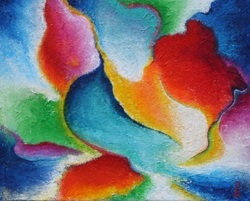 Ms. Ilg has studied with renowned artists in Europe and in the US, resulting in a continuing strong desire to work within a wide spectrum of techniques, styles, media, and themes. Ms. Ilg is known for her delicate watercolor botanicals, brilliant acrylic abstract paintings, unique mixed-media work, miniature oil landscapes, vibrant geometric designs, luminous reverse glass paintings, and for her innovative encaustic work. Ms. Ilg is a frequently exhibited artist and photographer, and a widely published poet. She has won numerous awards for her creative work, which can be found in private and corporate collections around the world. Regionally, Ms. Ilg is represented by the Asheville Gallery of Art in Asheville, North Carolina, and by the Miya Gallery in Weaverville, North Carolina, USA.